One decade ago, the US Supreme Court ruled the Scouts had the legal right to exclude gays, but the organization's new policy would allow local troops would be able to decide the issue for themselves. NBC's Pete Williams reports. Jennifer Tyrrell cried when she got the news Monday that the Boy Scouts of America may be changing its policy to admit gays and lesbians as Scouts and leaders. 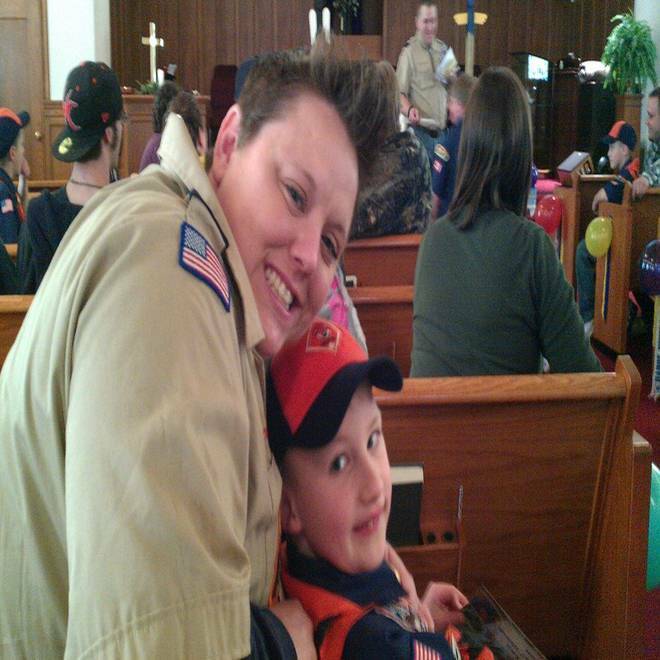 The mother of four children was kicked out of the private organization last year, as den leader of her son’s Tiger Cub pack in Ohio, because she is a lesbian. The longstanding policy has sometimes seen the quiet, or in Tyrrell’s case, public, exit of gays – an exodus that has rocked the Boy Scouts and led to growing calls for the group to open its doors to all who want to join. It’s not the ultimate, according to Tyrrell and others, because the proposal would eliminate the ban at the national level, but would allow local sponsoring organizations to decide whether or not they would accept gays, NBC News’ Pete Williams reported. Jennifer Tyrrell and her son Cruz. Tyrrell was ousted from her post as den leader of her son's Tiger Cub pack in April 2012 because she is gay. Still, Wahls said, it was a step in the right direction though the Boy Scouts do have a ways to go. “Compared to where we were seven months ago, with the BSA, you know, calling this the best policy for the organization right now and then seven months later understanding well actually … that’s not quite true, it’s a big development,” he added. Wahls was referring to the Boy Scouts announcement last July that it was sticking with the policy after revealing it had undertaken a confidential two-year review of the disputed membership guidelines. It also came a few months after Tyrrell was forced out and a day before she handed in a petition to national leaders with hundreds of thousands of signatures calling for her reinstatement. That prompted a number of Eagle Scouts to turn in their hard-earned regalia, with more than 200 posting their letters and photos of their medals, pins or certificates to a tumblr page started by Burke Stansbury, a 36-year-old communications specialist in Seattle, Wash., who decided to leave the Scouts for good over the issue. Stansbury welcomed the news of the proposed change but said he wasn’t sure if he would ever go back. One decade ago, the US Supreme Court ruled the Boy Scouts of America had the legal right to exclude gays, but the organization's new policy would allow local troops would be able to decide the issue for themselves. NBC's Pete Williams reports. “I sort of said all along that I was really making a decision to do this, that they’ve held on too long and that, you know, I’ve lost faith in the organization regardless of what changes they might make in the future,” he said. The discussion of the potential change in policy is nearing its final stages, according to outside scouting supporters. If approved, the change could be announced as early as next week, after the BSA's national board holds a regularly scheduled meeting. One of those most impacted recently by the Boy Scouts’ policy was Ryan Andresen, 18, and his family. Andresen said he was denied submitting his application for the Eagle rank to the national organization by his Scoutmaster after finishing his final service project last fall because he is gay, and after coming out as gay to his troop last summer. After much back and forth with the local council in Moraga, Calif., and hard feelings on both sides in a story that made national headlines for weeks, his application for the pinnacle Boy Scouts’ achievement was forwarded to the national headquarters for approval, said his father Eric Andresen, 52. 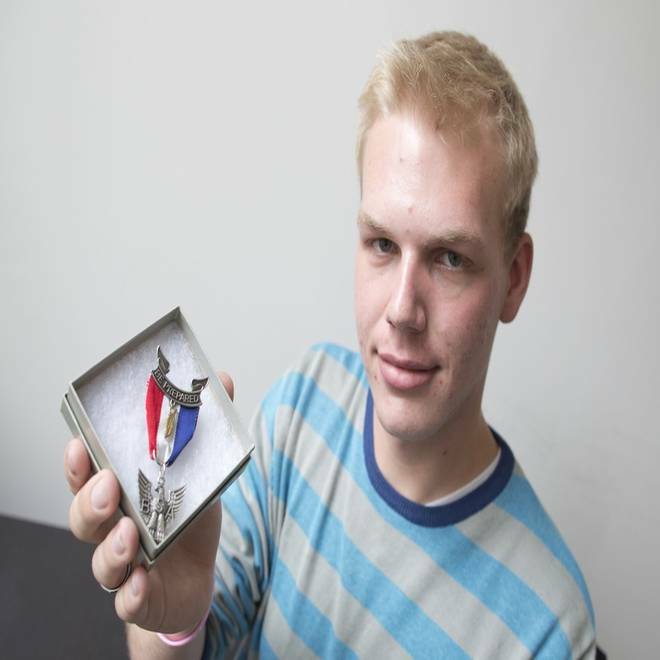 Ryan Andresen holds an Eagle Scout pin that was given to him by a fellow Scout who is gay on Friday, Oct. 12, 2012, in New York, N.Y.
Ryan, a high school senior, was still hoping for the award, even though he already knows he has earned it, Eric Andresen said. Eric Andresen, who resigned as the committee chair of his son’s troop after the problems began, said he was done with the organization after 10 years as an adult leader, but he hadn’t yet broached the possibility with his son of being able to participate as a volunteer or leader one day if the policy is changed. One of the Andresen’s main objectives was to help others, such as boys who may still be hiding in the closet. If you are a current or former member of the Boy Scouts and would like to share your thoughts on whether the membership policy should be changed, you can email the reporter at miranda.leitsinger@msnbc.com. We may use some comments for a follow-up story, so please specify if your remarks can be used and provide your name, hometown, age and Boy Scout affiliation.